In recent years in Los Angeles, I began noticing that artists have taken over utility boxes that sit at different intersections. They use these large, gray boxes as their canvas. Some merely slap a sticker on them, while others paint the entire thing. Sometime in late 2017 or early 2018, I began noticing these brown paper posters going up along La Cienega Boulevard with the name “INKSAP.” I became intrigued by their work but wasn’t really sure who “they” were. Then, as luck would have it, I was visiting one of my favorite bars, The Roger Room, and saw a fresh piece going up right before my eyes. I yelled out “Inksap,” which surprised him and a cameraman that he had tagging along with him. I introduced myself, as he continued to do what he does. A few days later I reached out to him to do an interview. Here it is. Enjoy. 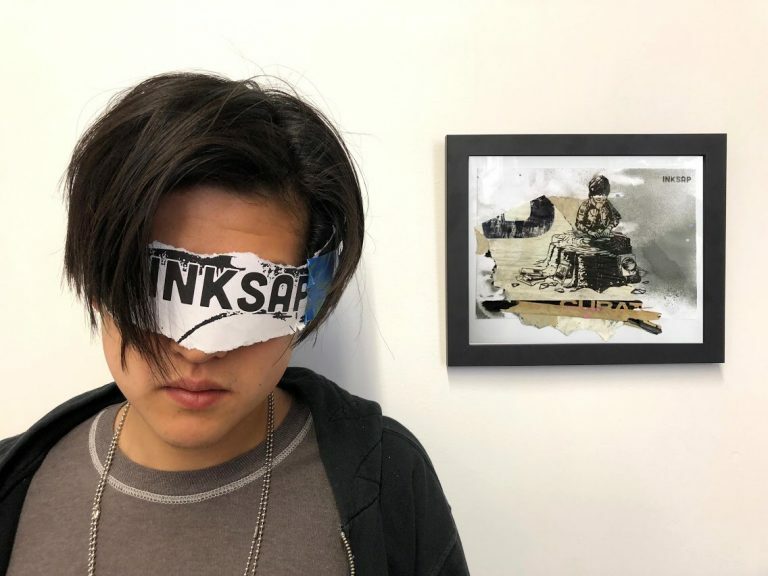 I first starting seeing your work about a year ago along La Cienega Boulevard and immediately wondered what sort of name Inksap was. Where does it come from, and where do you and your artistic sensibilities come from, more importantly? When I used to paint in plein air, I used tree sap as a medium for my oils. I showed my fellow artists this sap medium and one fellow called it “the Inksap method”. 😉 As for my artistic sensibilities, it comes from my exploration of human energy. The way we connect to one another is ephemeral. We use language, energy, and body gestures to connect us in each moment before time moves us on. I try to catch those moments that define who we are through drawing so the energy of the human can live. You mentioned that you are working on a documentary. What is that about, exactly? How did it start? Right now I’m working on a documentary titled Project US, an art collaboration between myself and Linda Lack, Ph.D. In 2017, her building was decimated by a drunk driver and the walled-up portion was placed with the piece “Tuyen, Kids and Tree” without her knowledge. For months she tried to connect with me, and me – believing everyone is out for me – I was skeptical at first. It wasn’t until her community validated her and her offer to buy the piece that I opened up. We connected and are now putting up art in the streets to share the same feeling Linda had the morning she saw the art on her building. As this story goes on, one of her clients and our documentarian, Stuart Paul, is documenting our story of going into the streets. We just had our story published in LA Times. We also have a show in Budapest late summer, a mural on Fairfax and looking at a few more opportunities. Tuyen is my grandmother’s name on my mom’s side. She is the last relative of mine from the mainland and the final connection to that world before my family came to the USA. I’m very inspired by her, especially the traditions and language. Through her, I get a view into a world I will not experience. I use her stories, photos, and life as a study and combine them into my world to relive a world I hope to retell. You are Chinese and Vietnamese. How does culture play an important part in your artwork? Do you come from an artistic family? Culture is what defines who we are. It’s what grounds us to our fellow human, especially ones that share our blood. And for me, I grew up as a second generation. So culture was always mixed for me, not just between Chinese and Vietnamese, but the culture of growing up in US vs the culture of my family. I always struggled with my identity as a Vietnamese. I didn’t grow up with many Viet or Chinese friends. My native tongue was not spoken at school and because so I always felt disconnected to my culture. So yes! Culture is important to me. Especially as an artist. Because I can use that element and connect back to where I came from. And speaking of where I came from, no, no one was visually artistic in my family. I think we had a few folks who were talented in music but nothing visually. The cooking is always great though! A great deal of the images in your artwork portray a person with a mask over their face, presumably to shield themselves from pollution. Are you an environmental artist? And, if so, is your main drive to help make the Earth a more livable place for everyone? I grew up surrounded by plants and living creatures. My grandma had a big garden in our house growing up and my brother and I would watch her tend the garden. So I would not say I am an environmentalist, but a green thumb, yes. I used to be more on the edge of environmentalism, which is why I depict people with a mask breathing out of a tree bag. As I grew more connected to my culture, my edge from environmentalism faded. I do care for humans to have better living conditions. So I have another series called Urban Tools. These are functional installations and tools that people would interact and use to pick up after their surroundings. Currently in production is the Trash Tac. It’s a newspaper trash pick up origami that one use to protect their hands from trash on the streets. You use this to throw trash away. I have more in the making but they are still being worked. Who are your greatest influences, as an artist? I’m always influenced by folks who have a vision, goal and plan to execute. I really like artists Gordon Marta-Clark, Norman Rockwell, Bruce Lee, Dieter Rams, Rolland Berry, Henry David Thoreau, and so many more. The elements of art are usually thought of as being form, color, line, and texture, but for you, they are elements that are connected to nature: Fire, Water, Air, and Earth. How do you incorporate those elements into your work? Fire, Water, Earth, and Air are the elements that turn art into artifacts. As an artist, my works are living. Once they are installed in the streets they have a life of their own. The four elements are the keys that alter art into ARTIFACTS. Fire ages and crumples the surface. Water softens and lifts it up. Air dries it and removes layers while Earth adds layers. When these elements are combined together into the installation, it becomes an ARTIFACT. After the process is complete, I collect these artifacts and use them in my works. I capture the energy and elements of the streets into my works and seal them in to live a second life. Other than the documentary, what else are you working on? Any shows coming up?